I am new to jewelry making, and I love making hand-stamped jewelry. I have recently purchased a tumbler (Lortone 3A), and I would like to know what steps I should take when creating my jewelry. Do I stamp, oxidize, and then tumble? Will the black remain in the letters? And how long do I tumble these items for? Any help you could offer would be great. MOST of the time, I texture, stamp, etc.... basically finish the jewelry piece and then tumble for 3-6 hours. Next I oxidize or add the patina. If the patina is one that I can tumble like liver-of-sulfur, I tumble the piece again after oxidizing for just an hour or so. This helps to clean any excess LOS residue and gives the piece a very nice polish without removing too much of the LOS. With silver or copper, if I don't want the piece too dark, I remove some of the patina with a fine 3M scrubby pad (you can also use fine 0000 steel wool) before re-tumbling. After they've tumbled again, buff them with a jewelry polishing cloth to remove more of the LOS patina and to give the item a very nice finish! For stamped items like in your photo, that may be enough. Black lettering looks great against bright silver, but you can't use LOS as it will darken all the metal and not just the lettering. After your pieces are nice and shiny from tumbling, fill-in the lettering using a black Sharpie-style marker. No need to be neat, the excess marker comes right off with a bit of 91% isopropyl alcohol and a Q-tip or cotton ball. Don't get them too wet or you'll remove the ink from the recessed areas of the lettering too. Buff with a jewelry polishing cloth to restore a mirror finish to the bright metal. 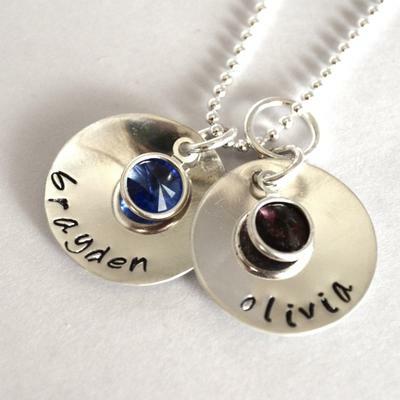 If the pictured pendants were created by you, they look more like marker-enhanced lettering vs. a patina like liver-of-sulfur. The marker holds up OK in the tumbler as long as your letter impressions are deep enough and even.